We have a little space, about 7 x 15, off of a sunporch on our apartment. 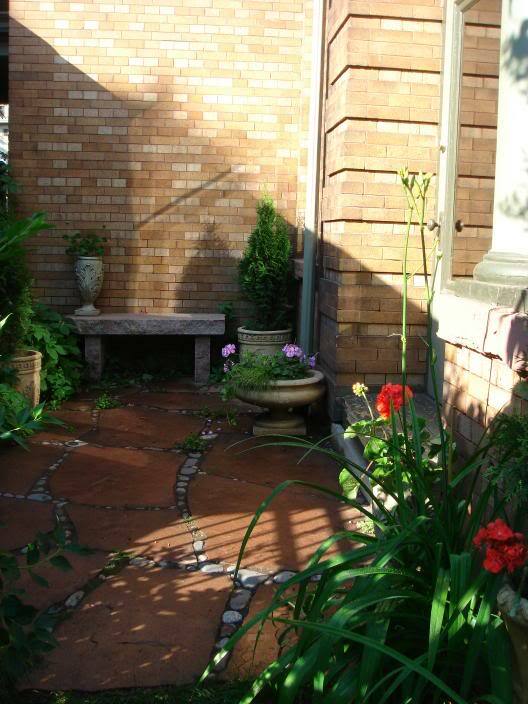 I have been working on turning this into my "secret" patio, with Greg's muscle. We removed old asphalt pavement, put in a bunch of class five, then laid sandstone pavers. I just finished putting lake superior rock between the pavers. All that it left is to fix the step to the sunporch. We got the granite bench for cheap at the end of a homeshow. Very nice, Martha. How was the asphalt removed? I need to redo my patio and I would like to remove ours without using a jackhammer. Very Nice! - What is the weight of those Sandstone Pavers? They look heavy! How thick are they? I thought it would still be snowing up there now. Don't you get summer from July 3-15? Yeah, yeah ,yeah. The bigger ones weigh between 50 and 100 pounds; the thickness varied from about two-three inches. But I moved each one about 50-100 times. We had aesthetic differences. Martha won most of those thousand fights. :P.
"summer from July 3-15" Yeah, now that global warming has set in. very nice. might i suggest getting some plantings with some height to them. that brick wall would make a really nice backdrop to some bamboo, for instance. here's a wonderful sunburst. it grows eventually to 45' with 2.5" dia. culms. and will survive 15°F. i've got one flanked by two tropical black bamboos. gorgeous. these are clumpers so won't spread much. likely they'd never hit 45 feet in your location & would take a few years for any considerable height. another good one would be asian lemon which only gets to 25 ft by 1' dia culms and will survive 13 degrees. i have two asian lemons flanking a timor black. or if you have something dark & skinny in your area to plant at that wall. black bamboo would look great on that color brick but won't survive your winters. ok, well, sorry about that. but whenever i go into someone's garden i have to do a little work. it's the gay in me. there's just no stopping it. Very nice patio....love the bench. Ooooh, that looks so nice! Great job. I admire all of the hard work also. LG4N: You are too funny! Martha and Greg, very nice secret patio. What is class five? * I am planning on doing our side yard and getting ideas. Thanks. Martha, I am super-impressed. The choice of stone and the layout is lovely! The finished product seems worth the arguments. We want to do a paved area in our backyard, but without pouring any concrete (would require permits since it would be "permanent"). I'd read about digging down 6"-8", spreading gravel, then a bed of sand, then placing pavers/stones and sweeping rock dust or sand between.. My DH and his friend insist that digging isn't necessary.. The soil is mostly clay here. Are they just being lazy? Also, is that concrete, sand, or rock dust between the stones/pavers in your pic? Very nice, Martha. * How was the asphalt removed? * I need to redo my patio and I would like to remove ours without using a jackhammer. Good luck. Our neighbor used a jackhammer to do something similar. We ended up having a guy come in with a front end loader and he scooped it up and hauled it away. Nothing like your bamboo. I need something that will last to 40 below. I did put in some virginia creeper vine to work up the wall. It was the only thing I could think of that might live. Temporarily, I put cedars in pots, which I will overwinter elsewhere in the ground. Nothing like your bamboo. * I need something that will last to 40 below. * I did put in some virginia creeper vine to work up the wall. * It was the only thing I could think of that might live. * Temporarily, I put cedars in pots, which I will overwinter elsewhere in the ground. Maybe ivy? The stuff appears damn near indestructible. Maybe ivy? * The stuff appears damn near indestructible. Just keep the ivy off the house since it will burrow its roots into the wood/mortar/brick and over time will crack it allowing water to enter and in your climate, freeze-thaw cycles will create some major damage in a few seasons. Keep it on a trellis to give it a place to climb but trim it away from the house. As for digging out existing ground to put in pavers...my suggestion would be to dig out at least a foot down to create a flat, level compacted bed to put the pavers on. If you don't they will sink at different rates and will look crappy after a while. Don't forget to but down a weed barried cloth under the pavers to keep down the weeds otherwise you will have an unwanted garden between your pavers. Very moist soils will require a deeper cut out area and more gravel/sand to keep the pavers level. Freeze-thaw cycles can also move them around if you don't have enough sand-mortar between the pavers. Very nice Martha and Greg, your patio looks like something from the Beacon Hill area of Boston, the little hidden gardens and green areas people make in the middle of this big chity. A trellis with ivy would work nicely on that wall or maybe a Clementis. I want to second what Steve said about the ivy. Keep it OFF the house. If you don't have a large job (more than ten feet? ), you might be able to score it with a circular saw and then pry (sp?) it away so that you end up with a clean cut. Lots of bull work though. "Need big man-boy,ugh." What is class five? *I am planning on doing our side yard and getting ideas. *Thanks. The class five is a primarily limestone mixture of small (as in "class 5") gravel/gritty sand that packs down well. *If you have clay soil in a climate with freeze and thaw cycles, which we do, it is very important to have such a layer or as Steve says, the stones won't stay put but heave out of the soil. 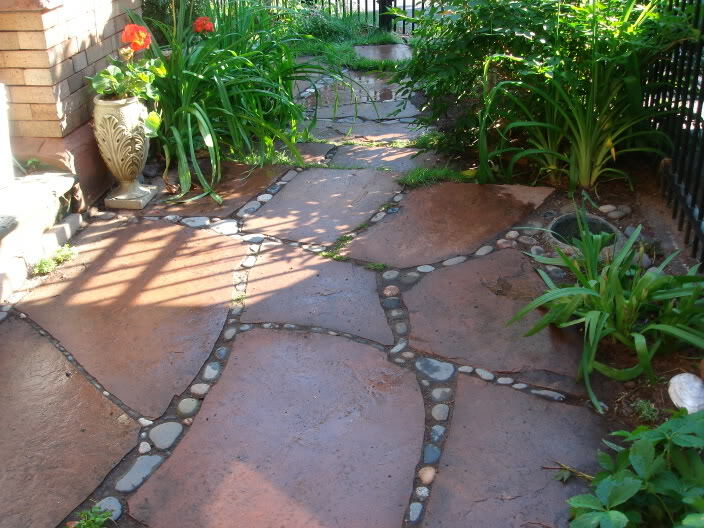 *Our neighbor used old cobblestones to make a patio and they were laid directly on the clay soil. *Now he has both drainage and heaving problems. Our climate isn't good for cementing in the stones, but you can use any number of things between the stones. *Plant grass in dirt. *Use decomposed granite, which packs down well. *Sand isn't great if you have large joints as it washes out. *Because this is a shady area I am coaxing moss to grow so I packed in a bunch of dirt on top of the sand. Did you look for Jimmy Hoffa when you removed the asphalt? Very, nice and very artistic. The only ivy that grows here is virginia creeper. *I planted it along the fence on the side of the patio. *I will let it grow up the fence and over to the wall a bit and pull it down evey couple of years. *People dispute the extent virginia creeper can damage mortor joints. *We had a lot of it growing on the building we used to own across the street. *The building was 100 years old and there was no apparent damage. *Greg had to pull it all off one year when he painted the trim. *No damage from the vine. *It has now grown up the cover most of the building again. *What I don't like about vines is that mice can use them as convenient stairways to look for access to your building.